Exams are beginning at UNB and another successful hockey season has come to a close. Looking back, the 2008-2009 season was one of the more memorable in recent history, not for the final result but for the adversity and highlights along the way. The team started by playing possibly the most exhibition games it has in years, and it was great to see so many teams from outside the AUS including Carleton, UQTR, Boston University and UMass. The V-Reds welcomed back Rob Hennigar and the Islanders Rookies, then followed it up with a great series against U of Maine. Adverstity hit the team in a number of ways. Attrition saw the dominant UNB forward line-up from 2008 lose the CIS player of the year (Rob Hennigar), a pair of veteran warriors in Denny Johnston and Nathan O'Nabigon, and perennial point-a-game player Brad Efthimiou, who finished school and left Canada to play pro in Germany. Then UNB's top forward recruit, Daine Todd, suffered a season ending injury vs Main, but not before scoring 3 goals in 3 games against some very tough NCAA competition, showing us a bit of the high-speed offence he's sure to bring next season. Injuries would haunt the forwards all year long, especially at CIS Nationals when the team's top forward, Hunter Tremblay, missed 2 games and played on one leg in the championship game. A new milestone was reached by team captain Dustin Friesen, who would set the team record for most games played by a V-Red at 137. The only games he missed at UNB were to help Team Canada bring back the gold medal from Italy with some other great AUS players back in 2007. Along the way he captained the team to two national championships, and is certainly going to be missed. Best of luck in the future Dustin! As for next year, well see what the future brings. Gone for sure are Friesen, Cuddihy, and Pearce. Looks like UNB will be losing defencemen David Bowman and Justin DaCosta. Justin McCutcheon's future is up in the air as well. The good news is we have a head start by adding Todd to the forward ranks. He played on the top line in his limited action last year. One thing is for sure, UNB will be returning with a formidable roster, and recruiting should get a boost both from recent success and from being rewarded with the priviledge of hosting Nationals in 2011 and 2012. UNB will need to pick a new team captain. Given all the players who wore letters for their team in junior, this is not going to be an easy task, but it's a nice problem to have. Some early front-runners are J.S. Dickson, Kyle Bailey, and Hunter Tremblay, but don't be surprised if a work-horse like Ryan Seymour or even Friesen's excellent defensive partner, Bretton Stamler, get some consideration. Let us know who you think would be a fit by posting some comments or voting for one of the selections mentioned. As for us, news is a bit slow this time of year, but we'll continue to pass on any credible information as it trickles in and will be posting some topics for discussion that have been recommended by some of you so check back a few times each week. In the meantime if you have something you'd like to say or contribute (we're always looking for ideas, photos, or videos to share) just drop us a line anytime. Good luck with exams! Most of us were here in Freddy Beach last Sunday cheering on the Reds, but there was a healthy contingent of UNB fans in Thunder Bay carrying the message in person. One of them captured the final seconds of the big win and we're happy to share that here, in case you were wondering what it was like, or want to watch this video every day until the puck drops next season. 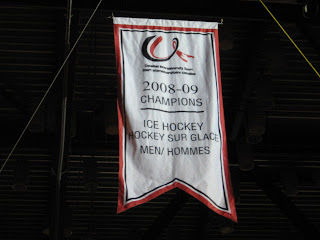 The 2009 CIS National Champions were welcomed back to the Aitken Centre by a large group of the UNB faithful on Wednesday night. The festivities lasted over an hour, and included some words of praise from local politicians, members of the community, university, team, and even some fans before the team gathered to unveiled the banner. After, they invited fans down to the floor to have their pictures taken with the team. During the presentation, a group of fans were invited to present a UNB flag autographed by the team to a player. The flag was the idea of two of UNB's biggest fans, Matt Johnson and Tom Davis, who you may know as the Fan Bus guys. These two went above the call of duty this year putting in a lot of hours to organize bus trips during the playoffs, chipped in to buy the flag, then brought it to Acadia and Halifax before sending it off to Thunder Bay. They were there in Woodstock for the first exhibition game, and were there last night to close the season. When the flag returned to Fredericton they contacted the V-Reds and arranged to have it presented to team captain Dustin Friesen on behalf of all V-Reds fans. Big thanks to them! This is the kind of stuff that separates UNB fans from the rest of the CIS.